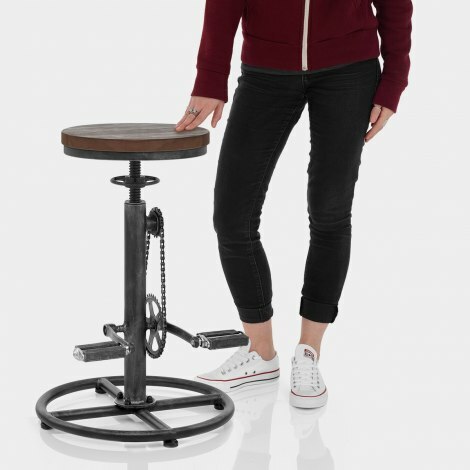 Put the pedal to the metal with the exclusive Pedal Stool, an attention grabbing design that will make a lasting impression. Set to make a vintage-style statement in your interior, the Pedal is a real conversation starter with its unique eccentric style. Crafted from solid wood, the round seat has a dark finish for a rustic vintage appeal, and has a compact backless design. You can also set the seat height to your preference with the handy screw thread mechanism and locking wheel. Showcasing a chic recycled look, the main attraction comes in the form of the authentic pedal style footrests. The pedals tilt to suit the position of your feet and are set at a fixed height to provide the best support when seated. Plus, a fixed chain accompanies the pedals and emphasises the realistic bicycle theme. A gunmetal finish works in tandem with the steel frame to create an industrial look, and consists of a central column and a circular base that cements the design. It is complete with protective floor guards on the underside. "Quality is excellent and they are very sturdy"
Bought 2 of these for my new kitchen island and totally love them. 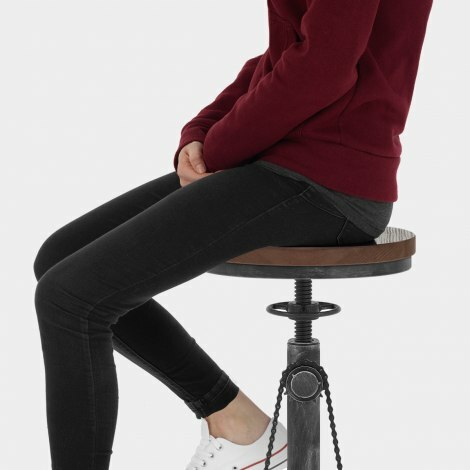 As a regular cyclist these unique stools certainly stand out and are a talking point when people visit. Eye catching!! Really pleased with these stools. The quality is excellent and they are very sturdy, they are a real focal point in our kitchen. Received in well packed box. Not too difficult to put together. Bought as a gift for my son that is very keen on cycling and thought it was a novelty present for him.